Here you have the opportunity exclusively online to purchase immediate-payment tickets for the upcoming season of the Bayreuth Festival. 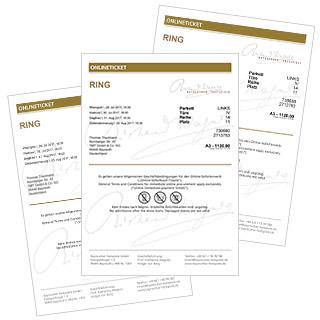 Are you already a customer of the Bayreuth Festspiele GmbH? You can login here with your customer number/email address. Is this your first time ordering from Bayreuther Festspiele GmbH? Please fill out the form to create a new account.